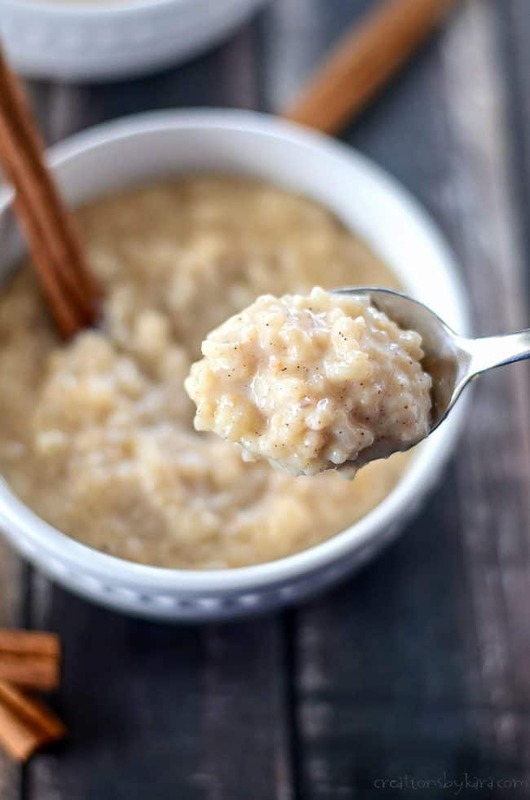 Crockpot Rice Pudding is rich and creamy and ridiculously easy. Just toss all the ingredients into your slow cooker and it does all the work! 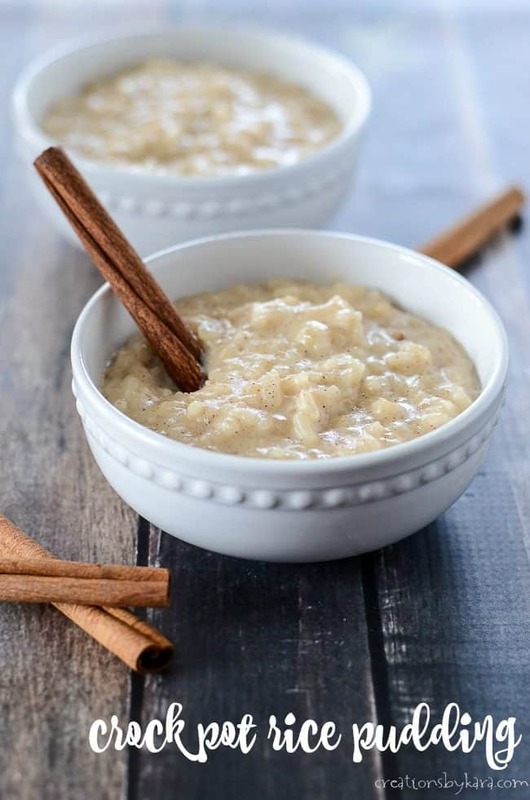 Creamy homemade rice pudding has been a favorite at my house since my boys were little. Some of us like it with cinnamon sugar sprinkled on top, some of us like it with a spoonful of jam. It’s a comforting dessert, but sometimes I add less sugar and we have it for breakfast. The one thing I don’t love about making rice pudding is that you have to stand at the stove and stir it until it thickens. It’s not hard, it’s just time consuming. Well not anymore! With this recipe, you just stir everything together in your slow cooker and walk away. It really doesn’t get easier than this. Just dump raw rice, evaporated milk, milk, sugar, butter, vanilla, cinnamon, and salt into the slow cooker. Stir everything together, and turn on your slow cooker. I’m usually in a hurry, so I always use the high setting. In my crock pot it takes just over 2 1/2 hours. You want to make sure you don’t overcook it, or it loses its creaminess and gets too thick. One thing that’s different about this recipe than my traditional rice pudding is that it doesn’t contain eggs as a thickener. Starch in the rice is what thickens the pudding, so don’t rinse your rice before you add it. 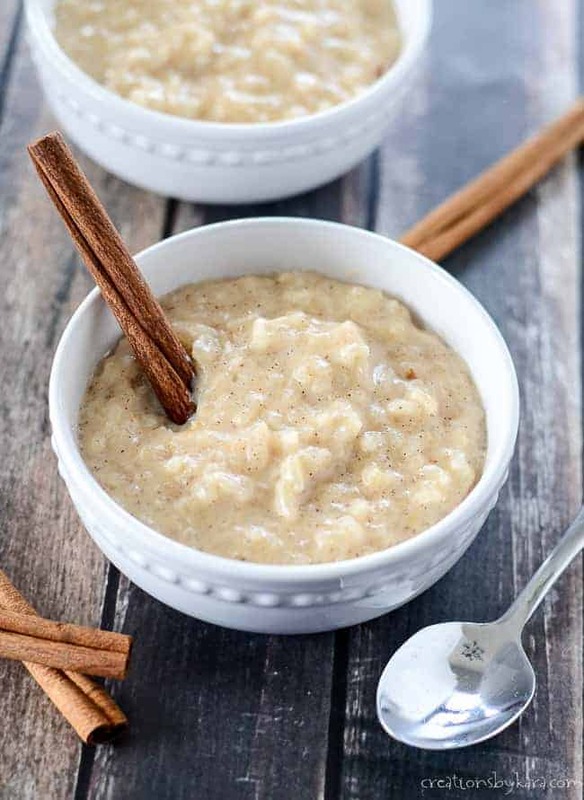 Cinnamon rice pudding made in the slow cooker. So easy! Add all ingredients to a slow cooker. Whisk together to blend in the cinnamon. Cook on HIGH for 2-3 hours, or on LOW for 4-5. I cooked mine on HIGH for 2 hours and 45 minutes. If l want to add raisins, do you add in the beginning or end of the cooking? Can I make with cream or 1/2 and 1/2? I think the cream would work. The 1/2 and 1/2 might also work. I just know I haven’t had luck using regular milk in the crock pot, it curdles. I love the recipe! Very easy! I doubled the recipe and cooked for about 3.5 hours on high and once it was done it was thick so I just added the rest of the evaporated milk. So there was 24oz total in evaporated milk! But wouldn’t add it all in the beginning! Yummy I can’t wait to enjoy it with my family ! So glad you liked it Jennette, and thanks for the tip about adding extra evaporated milk at the end! This didn’t work for me at all. Followed every step. Cooked it for hours on high and the rice was still hard. Made the house smell nice at least. Such a bummer. Sorry it didn’t turn out. It could be that your slow cooker cooks hotter than mine. If the rice is still hard and the liquid is gone, you could add more milk and cook it a little longer. Hello, I am making rice pudding for the first time. Don’t have the time to stand at the stove and stir. Thanks for the easy fix. One question, how many servings does this yield? Thanks again and Merry Christmas!!! It serves 6. Enjoy, and Merry Christmas to you too! I love rice pudding!! It is so comforting & tasty!! 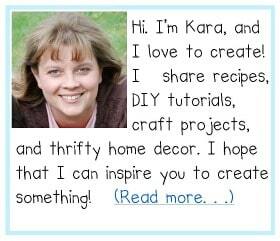 I love how easy it is to make, too! It really is comforting, and having it be so easy is definitely a bonus! 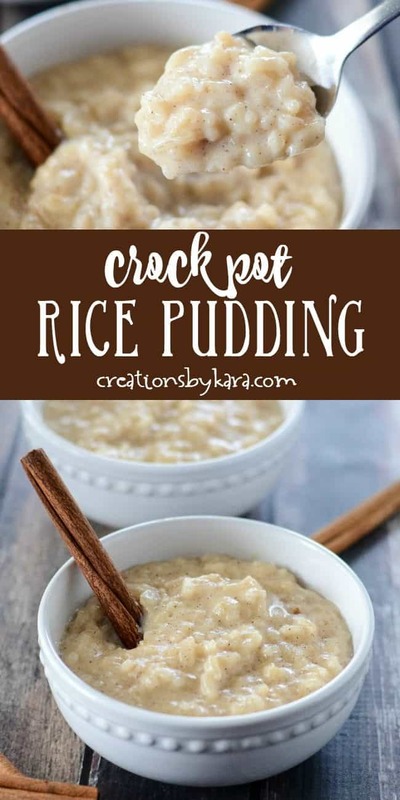 I’ve never done Rice Pudding in the crock pot! Such a great idea! I LOVE rice pudding, and in the crock pot?! Perfect! Love how quick and easy this was! 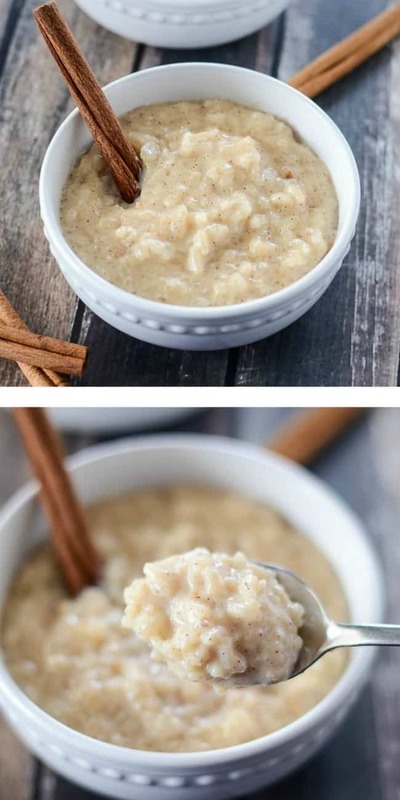 Love how easy this rice pudding is to make! My family loves it! So glad to hear it Anna! I need to make this ASAP. What a perfect holiday party idea. This is so cozy & delicious!! I love how creamy it is & the hint of cinnamon! I really love how easy this is!! And it tastes amazing!